Today at Enterprise Connect in Orlando, Avaya announced their new OnAvaya™ cloud-based contact center solution, built exclusively on Google Cloud Platform. Avaya provides solutions that help companies increase their engagement within a contact center across multiple channels and devices. Their new product – Customer Engagement OnAvaya™ Powered by Google Cloud Platform – provides a low-cost solution that allows customer service agents to work from anywhere, right in the browser. Aiming to meet the specific demands of a communications platform, Avaya chose Google Cloud Platform for its reliability, performance and scalability – and our simple pricing structure. OnAvaya™ runs on Google Compute Engine and utilizes Google's advanced networking capabilities to provide Unified Communications services running in the public cloud. The Chrome device based agent endpoints communicate using WebRTC with their cloud infrastructure. OnAvaya™ takes advantage of the unique capabilities of Chrome devices. You simply provision a Chromebook and headset and your customer service agents can work from home or wherever there's an Internet connection and have full Avaya contact center functionality. In the event of a snowstorm or network interruption, you can shift your support operations to any site that has Wi-Fi. Since employees no longer need a physical phone, you'll save costs on additional hardware. With Customer Engagement OnAvaya™ Powered by Google Cloud Platform, customers will be able to support growth in their business and seasonal spikes without huge capital investments. And since we manage the technology on our end, implementation time for OnAvaya™ customers should drop from months to weeks – or even days. 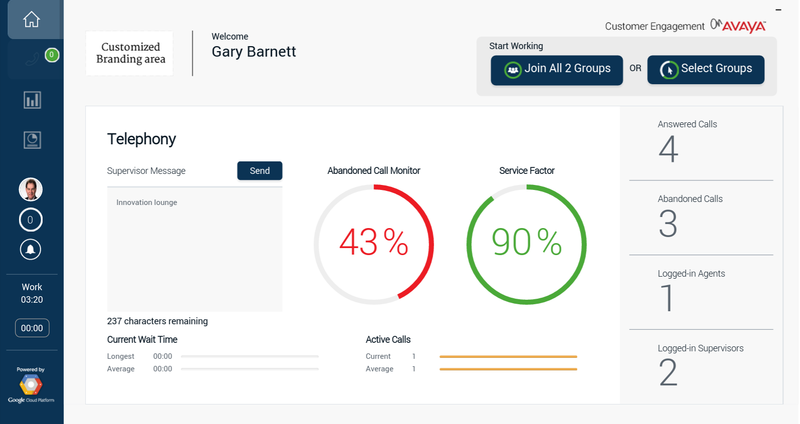 The solution will be available to certified Avaya business partners as well as Google for Work service partners starting in the spring of 2015. Learn more about the OnAvaya™ solution on their blog. We’re thrilled to welcome Avaya to the Cloud Platform family!